Exceptional Mediocrity: Safelink "Obama Phone"
I recently noticed several posts concerning the distribution of what are colloquially known as “Obama Phones” in my area. This was done under the banner of a company known as Safelink which advertised “free phones” for those who qualify. For the past few weeks, they have been operating at one of the many service stations in town known only as “We Cash Checks.” Most mornings that I passed by, there was an older Caucasian couple manning the tent and they usually had at least one prospective patron. Being unsure of the program’s origins (or the idea that Barack Obama was its architect), I decided to do a little research. A Google search of “Obama phones” invariable leads one to the 2012 viral video of Michelle Dowery emphatically insisting that Obama gave her a free phone (and therefore deserved a second term). 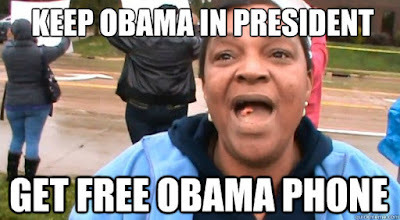 The memes generated from the video footage were subsequently utilized to illustrate the idea that Obama was an entitlement president. Certainly I do not wish to imply that Facebook memes are incapable of conveying the scope of complex economic assistance programs, but every now and then one might slip through the cracks. So, I decided to check out the FCC website and identify the origins of the free phone program. 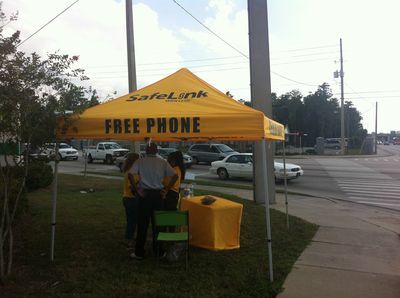 Companies like Safelink exist due to the Lifeline program that began in 1985. In turn, that program was included in the sweeping Telecommunications Act of 1996.The act was a truly bipartisan effort (introduced and passed by a Republican legislative majority and signed into law by Bill Clinton) that was wide in scope. Its provisions covered everything from requiring V-chip technology in televisions to block offensive content to de-regulating barriers to entry for telecommunication startups. The key section for programs like Lifeline would be the establishment of a Universal Services Fund. The idea was to provide access to the telecommunications grid for everyone in America since urban centers tended to have affordable coverage while the same level of service was astronomically higher in rural America. In order to fund this, the FCC began charging a “universal services fee” to carriers who will often pass this along to customers on their bill. That money would be used to subsidize telecom service to outlying markets. From 1985 until 2005, Lifeline was only available to subsidize landline phone service after which it was finally expanded to include pre-paid wireless carriers. Rural Health Care – around 6% of budget provides telemedicine (rural doctors can video-conference in a specialist from a large city) for sparsely populated areas. Safelink obviously operates under the Lifeline provision of the act and eligibility requirements are somewhat controlled by each state, but generally speaking if you qualify for food stamps, Medicaid, or section 8 housing you could get one of these. The government reimburses up to $10 per month per household for wireless phone service and eligibility is reevaluated annually. This usually covers around 100 minutes a month and unlimited texts. Additional minutes / service require purchase of a pre-paid service card. This incentivizes companies like Safelink to aggressively market the program to the public so that when they run out of "free" minutes they buy more. As for the phones, at least in my area, they are provided by Tracfone and the most glamorous smartphone they offer is a reconditioned LG. None of the phones offered are 4G/LTE capable. The more likely scenario is that you would walk away from the tent with a flip-phone. Details are important here. There is certainly a vast difference between the implication that the president issued an executive order that gives a Verizon iPhone 6s Plus and an unlimited data package to every welfare recipient and the reality that a three-decades old government program distributes relatively-antiquated phones with limited service to households in poverty. Now some may still disagree with the philosophy of the program (and the underlying assumption that access to affordable communications is a right rather than a privilege), but in the grand scheme of the Universal Services Fund the vast majority of the $8 Billion in subsidies benefit remote and rural areas. Furthermore, one could argue that the Lifeline program (which began under Raegan / secured ongoing funding under Clinton / and expanded to cover cell phones under George W.) owes very little of its successes or failures to the current administration. Perhaps the ultimate irony is that one of Obama supporter’s ignorance of the program became the primary source of information for those who opposed it. In other words, we tend to be much more adept at disseminating outrage than understanding why we are so angry.